Note: I also posted this on my other blog, Books and Other Miscellany. 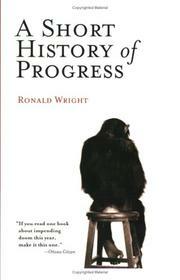 My thoughts on A Short History of Progress, by Ronald Wright, can be summarized as follows: first, that everyone should read it, and second, that it triggered a minor existential crisis. Why, you might ask, do I think everyone should read a book that has the potential to trigger an existential crisis? Well, first of all, not everyone will react the same way that I did (the are other things going on in my life right now that likely contributed to my existential crisis; if that hadn’t been the case this book may not have triggered one). But in fact I think everyone should read it precisely because of its power to make you think about and question the meaning of existence. Essentially Wright takes you a giant step back from your daily life and gives you a bird’s-eye perspective on human civilization and progress. He looks at four case studies of civilizations in human history that continued down the path of “progress” to the point of collapse. Over and over, humans have followed the pattern of overusing their environment until it can no longer sustain their numbers, continuing towards collapse even when it should be clear that they are living unsustainably. His point is that we are currently following the same exact pattern – our growth is accelerating in a clearly unsustainable manner, and we are causing environmental change that will be our downfall. However, there is a crucial difference from past civilization collapses: during the time periods of the cases he presents, there were many mostly isolated civilizations on earth, and the collapse of one did not significantly impact humans living on the other side of the world. Now, all humans are a part of one big civilization, and if it collapses it will impact all living beings on the entire earth. Before I reached the end of the book, I started feeling that all our attempts to reverse climate change and prevent civilization collapse are both helpless and pointless. In the grand scheme of things, why does it really matter if our civilization falls apart or not? Why does it even matter if the human species continues to exist or not? Someday it will not. Someday the entire earth will fall into the sun. Deep in my heart I feel that it does matter, but I lost my grasp of why. The most compelling reason for reforming our system is that the system is in no one’s interest. It is a suicide machine… I honestly don’t know what… the hard men and women of Big Oil and the far right… think they are doing. They have children and grandchildren who will need safe food and clean air and water, and who may wish to see living oceans and forests. Wealth can buy no refuge from pollution; pesticides sprayed in China condense in Antarctic glaciers and Rocky Mountain tarns. And wealth is no shield from chaos, as the surprise on each haughty face that rolled from the guillotine made clear. Things are moving so fast that inaction itself is one of the biggest mistakes. The 10,000-year experiment of the settled life will stand or fall by what we do, and don’t do, now. The reform that is needed is not anti-captalist, anti-American, or even deep environmentalist; it is simply the transition from short-term to long-term thinking. From recklessness and excess to moderation and the precautionary principle. We are now at the stage when the Easter Islanders could still have halted the senseless cutting and carving, could have gathered the last trees’ seeds to plant out of reach of the rats. We have the tools and the means to share resources, clean up pollution, dispense basic health care and birth control, set economic limits in line with natural ones. If we don’t do these things now, while we prosper, we will never be able to do them when times get hard. Our fate will twist out of our hands. And this new century will not grow very old before we enter an age of chaos and collapse that will dwarf all the dark ages in our past. A Short History of Progress is a compelling and important book. One way you can look at the present human situation is that we can either choose to change now and become a sustainable civilization, or we will be forced to change later by unpleasant circumstances out of our control. We have the opportunity to learn from the past, but will we take advantage of it? I believe humans are capable of much more than we currently demonstrate, and if we do not make the necessary changes now we will be failing our own capabilities. At the gates of the colosseum and the concentration camp, we have no choice but to abandon hope that civilization is, in itself, a guarantor of moral progress. Civilizations have developed many techniques for making the earth produce more food – some sustainable, others not. The lesson I read in the past is this: that the health of land and water – and of woods, which are the keepers of water – can be the only lasting basis for any civilization’s survival and success. Capitalism lures us onward like the mechanical hare before the greyhounds, insisting that the economy is infinite and sharing therefore irrelevant. Just enough greyhounds catch a real hare now and then to keep the others running till they drop. In the past it was only the poor who lost this game; now it is the planet. We should therefore be wary of technological determinism, for it tends to underestimate cultural factors and reduce complex questions of human adaptation to a simplistic “We’re the winners of history, so why didn’t others do what we did?” We call agriculture and civilization “inventions” or “experiments” because that is how they look to hindsight. But they began accidentally, a series of seductive steps down a path leading, for most people, to lives of monotony and toil. Farming achieved quantity at the expense of quality: more food and more people, but seldom better nourishment or better lives. People gave up a broad array of wild foods for a handful of starchy roots and grasses – wheat, barley, rice, potatoes, maize. As we domesticated plants, the plants domesticated us. Without us, they die; and without them, so do we. There is no escape from agriculture except into mass starvation, and it has often led there anyway, with drought and blight. Most people, throughout most of time, have lived on the edge of hunger – and much of the world still does. The concentration of power at the top of large-scale societies gives the elite a vested interest in the status quo; they continue to prosper in darkening times long after the environment and general populace begin to suffer. [T]errorism cannot be stopped by addressing symptoms and not the cause. Violence is bred by injustice, poverty, inequality, and other violence. This lesson was learnt very painfully in the first half of the twentieth century, at a cost of some 80 million lives. Of course, a full belly and a fair hearing won’t stop a fanatic; but they can greatly reduce the number who become fanatics. Archeology is perhaps the best tool we have for looking ahead, because it provides a deep reading of the direction and momentum of our course through time: what we are, where we have come from, and therefore where we are most likely to be going. Unlike written history, which is often highly edited, archeology can uncover the deeds we have forgotten, or have chosen to forget. It is of little use trying to suppress terrorism if the production of deadly devices continues to be deemed a legitimate employment of man’s creative powers. Nor can the fight against pollution be successful if the patterns of production and consumption continue to be of a scale, a complexity, and a degree of violence which, as is becoming more and more apparent, do not fit into the laws of the universe, to which man is just as much subject as the rest of creation. Equally, the chance of mitigating the rate of resource depletion or of bringing harmony into the relationships between those in possession of wealth and power and those without is non-existent as long as there is no idea anywhere of enough being good and more-than-enough being evil. African Leadership Academy was founded in 2004 with the belief that ethical leadership is the key to transforming the African continent. Founders Fred Swaniker, Chris Bradford, Peter Mombaur, and Acha Leke sought to create an institution that would develop, connect, and support those individuals who will lead the continent toward a peaceful and prosperous future. In the two years that followed, the founding team built a powerful network of advisors and developed a robust, sustainable operating model for the Academy, a world-class, pan-African secondary institution on the outskirts of Johannesburg, South Africa. Their five founding beliefs are: address the underlying causes of problems, the power of one, the power of youth, the need for pan-African cooperation, and entrepreneurship is fundamental to growth. The core values that form a foundation for their program are integrity, curiosity, humility, compassion, diversity, and excellence. I admire the mission, beliefs, and values of African Leadership Academy and think it has the power to help bring peace to the world. Without housing, education or emotional support, 65 percent of foster youth will face imminent homelessness, 20 percent will be arrested or incarcerated, 46 percent will complete high school and only 3 percent will graduate from college. It is inspiring to me to learn about programs like this. Youth who are in foster care already have troubled lives, and badly need this sort of support to help steer them in a positive direction. It is an important way to strengthen our communities and decrease violence and crime. I am glad that there are wonderful programs like First Place for Youth out there! You are currently browsing the Musings on Peace blog archives for January, 2010.